That Was Then… Spendor SP2/3E | What Hi-Fi? Evolution isn’t always obvious. Things can sometimes change significantly without looking all that different. Spendor’s Classic 2/3s are a case in point. Put them next to their great grandfather, the SP2/3E, and there’s an unmistakeable resemblance. 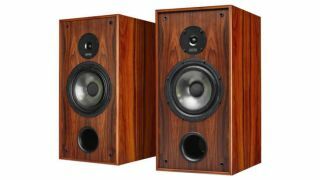 They’re both large, two-way standmounters that use BBC-inspired thin-wall cabinet construction and a hefty 21cm mid/bass driver. But given two decades’-worth of development between the two, it comes as no surprise to find every element of the design has evolved – from the more rigid baffle and improved cabinet damping of the new model to its vastly more capable drive units. Even fit and finish have improved notably. Despite this, it’s surprising just how close the two speakers are in sonic character. For all the Classic 2/3s’ development, its DNA remains undiluted SP2 through and through. Listen to the two models side by side and it’s obvious the newer is better in every way. They’re more transparent, have far greater resolution and deliver rhythms with precision the old timer just can’t match. In a direct comparison, the old SP2/3Es sound a little blurred and congested when playing complex material, and a touch tame and restrained overall. Yet despite all that, we like the oldies a lot. They have a wonderfully unforced, big-boned sound that makes most modern standmounters – even ones costing thousands – sound small, thin and just a little bit aggressive by comparison. There are a number of reasons for this, with the unusual cabinet construction coming high on the list. Most current speakers have rigid, heavily braced enclosures to reduce resonance and give their drive units a firm foundation to work from. Sounds sensible, right? The problem is that it’s impossible to get rid of all the resonance and, by making the structure more rigid, those vibrations are moved into the midrange - precisely where people’s hearing is at its most sensitive. Spendor’s Classic models get around that by having a thin-walled cabinet that’s designed to flex. The engineers then add plenty of damping to ensure that the resonances don’t get out of hand. This kind of design moves resonances into the bass region where our ears are less bothered by such distortions. Having such a big cabinet and mid/bass driver helps too. Most of the larger two-way speakers on the market tend to favour mid/bass drivers of around 16.5cm diameter. The SP2/3E’s unit uses a whopping 21cm cone. That may not seem much of a difference, but (using what remains of our ‘O’ Level maths knowledge) it equates to the Spendor driver having just over 60 per cent more radiating area than most. Quite simply, it’s capable of shifting far more air. Combined with an unusually large 54cm tall cabinet, the sonic benefits are plentiful. They range from deeper bass and higher volume levels all the way to rendering a wider range of dynamics more easily. Simply put: on paper, a good big speaker will usually outperform a good smaller speaker in most ways. That’s the way it sounds in use too. The SP2/3Es deliver the large-scale dynamic shifts of Orff’s Carmina Burana with ease. There’s plenty of authority in the presentation and it’s built on extended, nicely textured lows. That thin-walled cabinet construction has benefits, but it also introduces extra richness into the lower-mid and bass regions. While that affects precision and agility, it also adds highly appealing warmth to the Spendor’s presentation. This helps the speakers sound full-bodied, and makes them kinder to less-than-perfect recordings and partnering equipment. The SP2/3Es excel in the midrange where their richness, seamless integration and unforced dynamics make vocals and instruments sound solid and subtle. There’s a total lack of harshness, making these speakers easy to listen to over long sessions. Rarely have we come across something that’s so friendly and undemanding of the listener. However, there is a downside to this easy-going balance - and it becomes apparent when we play harder-hitting music such as Watch the Throne by Jay Z and Kanye West, or Bruce Springsteen’s Born to Run. The Spendors sound a little too smooth and sophisticated, diluting some of the recordings' energy in the process. The current iteration, the Classic 2/3s, are much better in this respect. Stereo imaging remains good and focused, even if it isn’t as out-of-the-box as we’ve heard, and refinement still stands up well by current standards. Detail levels are pretty good, and we certainly don’t feel we’re missing out. We think these speakers are still good enough to give many competitors below the £1500 a bloody nose. That’s pretty impressive for something that was designed a couple of decades ago. The SP2/3Es aren’t perfect, but they still do so many things so well that we can’t help but be impressed. If you value refinement and unforced dynamics over outright attack, and like a smooth, warm balance, they’re definitely worth seeking out.